In order to fly our sites, pilots MUST be BHPA members, OR be members of the equivalent foreign national association. All persons undertaking flying activities on LMSC sites agree to abide by the requirements and recommendations of the BHPA, as well as those of the LMSC. Note that this site guide is precisely that – a guide. We do not, and cannot, guarantee that the information is 100% accurate. It is updated, but it is the responsibility of the pilot to make sure that a) they consult the guide, and b) take into account conditions on the day when flying. (See also the wind rose at the bottom of this page). Please notify sites@longmynd.org of any errors and omissions. For the members-only sites, temporary guest membership can be obtained by contacting any committee member (see the committee page for email addresses). The file linked below is a Google Earth kmz (not kml) file. It shows all our sites on Google Earth. You will probably need to save it to your local computer first. If it saves it as a zip file rather than a kmz file, just unzip it and double click on the kml file when unzipped. If you want to add any information to the site guide – e.g. tips on flying it, particular issues with the site, etc. – email comms@longmynd.org and we will add it to the site information. Alternatively, you can add comments to the individual site pages. Many of our sites are in areas used for training by low flying military aircraft during the week. Please use the freephone NOTAM service on 0800 515544. Information on airspace for each site is indicative only, and not guaranteed to be correct; always use a map with current airspace if going XC. Please protect your sites by reasonable and courteous behaviour to others both on the ground and in the air. Do not interfere with wildlife, disturb farmer’s stock or damage fences hedges etc. Please keep all gates shut and take your litter home. NO dogs are permitted on any of our sites. If you are new to our sites, then please contact a club coach for advice about conditions, particularly if you are a low airtime pilot. See the list of coaches on the website. At certain times of the year temporary landing areas may be in use, please check before flying where these are. Non-flying guests, particularly children, are the responsibility of the member bringing them on site and must be made aware of all safety related restrictions. Please report any incidents or damage to the club committee immediately. A few sites are members only, but most may be flown by visiting pilots as long as they are members of BHPA (or equivalent national organisation in the case of overseas visitors). Please vacate landing areas immediately and de-rig/fold up in a place which causes no hazard to landing aircraft. Be aware of hang glider landing approach areas. Do not slope land or launch a paraglider in a hang glider overshoot area. Do not ground handle in a landing area. Hang gliders cannot slope land. When it becomes scratchy, paragliders should slope land to give them a change to get up and top land. Please take note of the guidance provided under the Long Mynd site information on flying with model aircraft and sailplanes. PLEASE NOTE: paramotors are NOT permitted to launch from any of our sites. There’s a number of other sites in the area which are not LMSC sites, but which our members often fly. For more information on these, we have linked to the web site of the relevant club. The most common of these are listed immediately below. The wind rose at the bottom shows sites covering a much wider area, but includes LMSC sites. Long Mountain: (N-NW): There is a £5 site fee for flying here. Pay this via YX Paragliding using the link at the bottom of their home page. 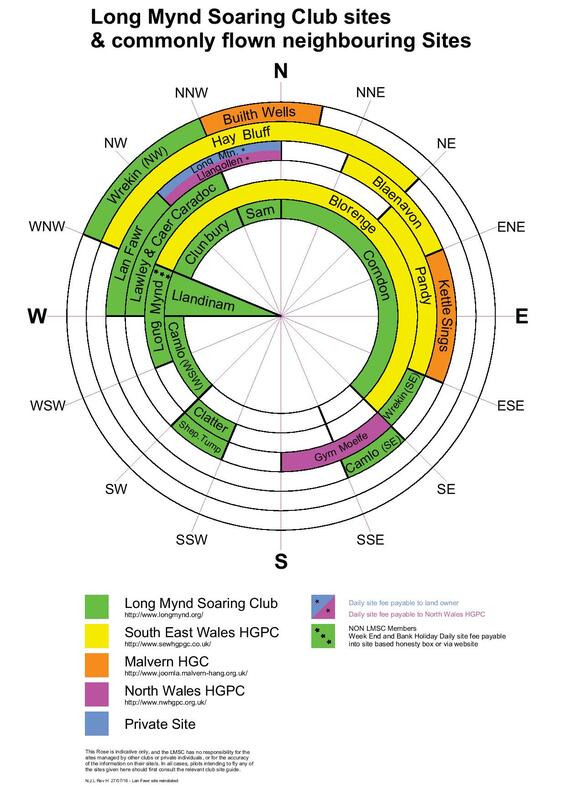 This wind rose shows the LMSC sites, plus other sites within easy driving distance from the Mynd. Note that this is indicative only, and the LMSC has no responsibility for the sites managed by other clubs or private individuals, or for the accuracy of the information on their site. In all cases, pilots intending to fly any of the sites mentioned here should first consult the relevant site guide. You can also download a PDF version of this.